Mental Health Gun Laws Unlikely To Reduce Shootings : Shots - Health News A New York law that requires mental health professionals to report potentially violent patients probably won't accomplish much, specialists say. Studies show that even highly trained professionals are often wrong about which patients become violent. 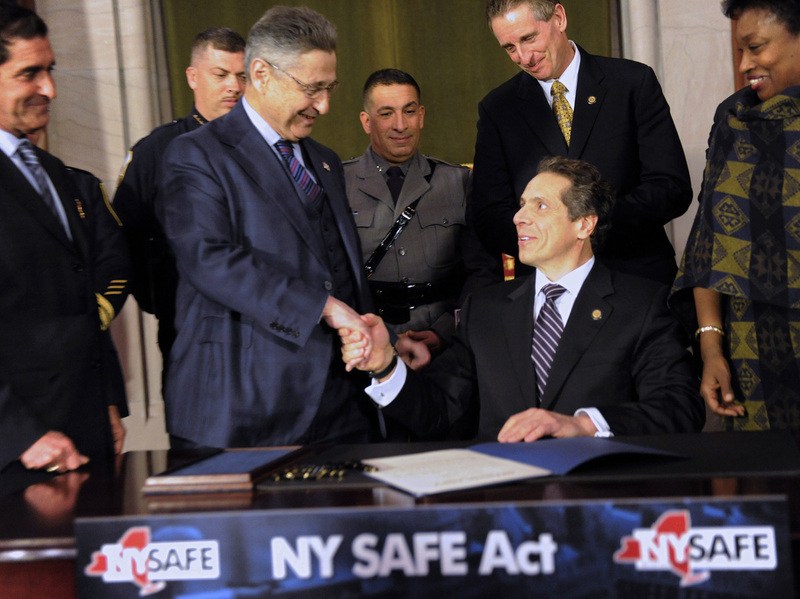 State Senator Jeff Klein (L-R), Assembly Speaker Sheldon Silver, Lieutenant Governor Robert Duffy and Senator Andrea Stewart-Cousins congratulate New York Governor Andrew Cuomo after he signed the New York Secure Ammunition and Firearms Enforcement Act on Tuesday. The approach is part of a gun control law passed in New York yesterday in response to the Newtown, Conn., shooting a month ago. But it's unlikely to work because assessing the risk of violent behavior is difficult, error-prone and not something most mental health professionals are trained to do it, say specialists who deal with violence among the mentally ill.
"We're not likely to catch very many potentially violent people" with laws like the one in New York, says Barry Rosenfeld, a professor of psychology at Fordham University in The Bronx. The New York law says mental health professionals must report people they consider likely to do harm. It also gives law enforcement officials the power to take guns from these people. Such laws "cast a very large net that will probably restrict a lot of people's behavior unnecessarily," Rosenfeld says. "Maybe we'll prevent an incident or two," he says. "But there are other ways that would be more productive." Better alternatives include reducing the total number of guns and improving access to mental health care, Rosenfeld says. One of the biggest problems with laws like the one in New York is that it asks all mental health professionals to make assessments that are difficult for even those with years of special training, says Rosenfeld. Rosenfeld says when he is called in to assess a person's risk of violence, "I typically have the benefit of a lengthy face-to-face interview, records on their criminal and mental health history, a tremendous amount of information at my disposal that the typical mental health professional on the fly simply doesn't have." And even highly trained professionals with lots of information often get it wrong, research shows. A study of experienced psychiatrists at a major urban psychiatric facility found that they were wrong about which patients would become violent about 30 percent of the time. That's a much higher error rate than with most medical tests, says Alan Teo, a psychiatrist at the University of Michigan and an author of the study. One reason even experienced psychiatrists are often wrong is that there are only a few clear signs that a person with a mental illness is likely to act violently, says Steven Hoge, a professor of psychiatry at Columbia University. These include a history of violence and a current threat to commit violence. Without either of these, Hoge says, "an accurate assessment of the likelihood of future violence is virtually impossible." "The biggest risk for gun violence is possession of a gun," says Hoge. "And there's no evidence that the mentally ill possess guns or commit gun violence at any greater rate than the normal population."